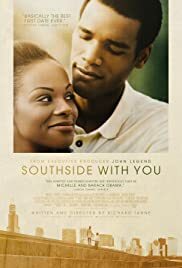 Finally saw “Southside with You,” the 2016 dramatic film that lovingly, tenderly, never cloyingly portrays the first date that then-Michelle Robinson had with Barack Obama in 1989. And, oh, what a date it was in forging a bond that would not be broken. I am happy to report that it is a first-rate romantic movie worthy of the future First Lady and the first African-American U.S. president because it depicts them just as they were then – two young, idealistic lawyers still finding themselves and what they wanted to do with their lives. Tika Sumpter and Parker Sawyers are sensational as Michelle and Barack, respectively. They capture the fullness of their humanity, intelligence, wit and grace. They nail the dynamic the couple enjoyed as highly educated, aspirational young professionals looking to make a difference in the world. They nail, too, a desire to find a soulmate with whom they can share their life. But neither will be easily satisfied. Each has defenses and hurts that must be overcome if they’re to let their guard down enough to let someone else in. Writer-director Richard Tanne very smartly confines the entire story to everything surrounding that first date. The preparation. The anticipation. The awkward feeling out process. The long walks and talks. Viewing an Afroc-centric exhibition at a museum. Taking in a community meeting. Seeing Spike Lee’s “Do the Right Thing.” The after glow of their day into night first date. When the events of the film take place, the two of them work at the same law firm. She’s an associate and he’s an intern. She acts as his advisor there as he learns the ropes. It’s Barack who initiates their seeing each other outside of work on the pretext of taking her to a meeting he feels certain she’ll find interesting. She’s adamant about their outing not being a date and he’s just as insistent that it is a date as far as he’s concerned. We learn he’s been pestering her to go out with him for some time. On their various stops that fateful day in their lives, they learn vital things about each other that confirm they share many of the same passions even if they don’t always see eye to eye on everything. Michelle really makes Barack work to earn entry into her heart and win her over. The clincher, we think, is when he’s asked to speak at the community meeting and he charms the crowd with his genuine, charismatic message of hope. She sees the common touch he has with people. But it’s really when he buys her her favorite ice cream that she finally melts. I was amazed to discover this was Tanne’s feature film debut. He is a talent to be watched. Sumpter co-produced the film with him and music artist John Legend executive produced the project. The creators made the film on location in a variety of spots that Michelle and Barack actually traversed that first date – from downtown to the South Side to the West Side. It all plays out very naturally and organically, not forced or contrived. I didn’t know either of the lead actors before this film but they both have impressive credits and I will definitely be looking for them from here on out because each brings an appealing presence to the screen, Together, they have real chemistry. I like that the story ends with them basking in their individual homes after the date – each filled with his/her high from the heady experience. Their bright futures are before them and they already know they want to be together for wherever their journeys lead. They couldn’t possibly have known what history they would be making barely more than a decade and a half later. We’re left with two young people on the move, newly in love, and eager to make their mark. They certainly would go on to do that. Hell, the Obamas are still only in their early 50s and may have decades ahead of them to make even more impact. For some reason the film didn’t do much at the box office but I hope it is finding its audience online. It did deservedly receive many away nominations. I found the film on Netflix and I’m sure it’s available on other viewing platforms as well. Check it out, as I’m sure you’ll find it well worth your time.